Is Chamomile Strong Enough to Be a Prescription Medicine? Most people are well aware of how popular chamomile is as a nighttime sleep aid. But unlike other natural cures for occasional insomnia, there's actually some substantial scientific evidence behind chamomile's effectiveness. If you're ready to learn all about how and why you should make chamomile a part of your bedtime routine, then this article is for you. Chamomile For Dozens of Different Health Afflictions? Of course, if you're reading this right now, the two most important things in the list above are likely anxiety and insomnia. And we have good news: most of the scientific proof associated with the effectiveness of chamomile has to do with both of those disorders. For the purposes of this article, we will mainly be talking about the German species of chamomile known as matricaria chamomilla. It is one of the most potent species of chamomile and it is also the species that has the most scientific testing associated with it. Over the years, and still today, one of the most popular ways to take matricaria chamomilla is to make an herbal infusion out of the flowers and brew it up into a tea. 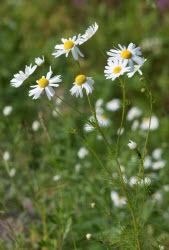 For more potent doses, concentrated chamomile extracts are sold in pill or capsule form. Because chamomile is so easy to obtain, and so difficult to trademark, major pharmaceutical companies don't spend a lot of time trying to inform the public about chamomile or market their own supplements - instead opting to continue pushing expensive and risky pharmaceutical drugs. Germany, however, is an exception to this practice. They're one of the few first world nations where health officials and medical experts regularly prescribe chamomile to treat stress, insomnia, and to ease digestive upset. In Germany, chamomile is a level B drug and can be prescribed by doctors as an anti-anxiety medication. The biological makeup of the chamomile plant includes dozens of different flavonoids, flavanols, and other biological compounds which have healthy effects on the brain and body. In the central nervous system, camille compounds can bind to GABA receptors after crossing the blood-brain barrier. When molecules bind to GABA receptors, that means there's more free-floating GABBA available in your brain. GABA is a well-known neurotransmitter associated with feeling relaxed and less anxious. And if anxious thoughts are keeping you awake at night, this relaxed state can make it easier to fall asleep. Thankfully, finding a quality chamomile supplement isn't as complicated as flying to Germany and asking for a doctor's prescription. You can pick up chamomile teas and supplements just about anywhere. Fancy vitamin shops, drug stores, and supermarkets all sell some version of chamomile supplements. But the chamomile alone may not be enough to relax you and lull you into a peaceful sleep at night. For that, you'll have to do a little more digging and seek out a quality herbal sleep supplement that pairs chamomile with other herbs and botanicals. Chamomile is excellent when paired with similar plants. Together, they can create a powerful synergistic effect. Common pairings include melatonin, valerian root, hops extract, and passionflower, among others. Many of these plants work with chamomile to block brain receptors, freeing up more GABA and making you feel relaxed. Others can contribute flavanols and flavonoids to your system, the same way chamomile does, that reduce harmful brain inflammation. Such inflammation can, over time, reduce your body's ability to generate GABA, serotonin, and melatonin - all of which are important compounds when it comes to helping you prevent sleep deprivation. You don't need to rely on harsh prescription drugs or unnatural chemicals to help with your sleepless nights. All it takes is adding a quality supplement - especially one containing chamomile - to your nightly routine. And you can find one of the best supplements here.